Calf Injury In Runners: How to Assess, “Fix” & Prevent! Calf injury in runners…what an exhausted, yet seemingly unresolved topic 🙂 As runners, it doesn’t take long to realize that your calves are invaluable to you! Let’s look at how to best take care of them for optimal performance. 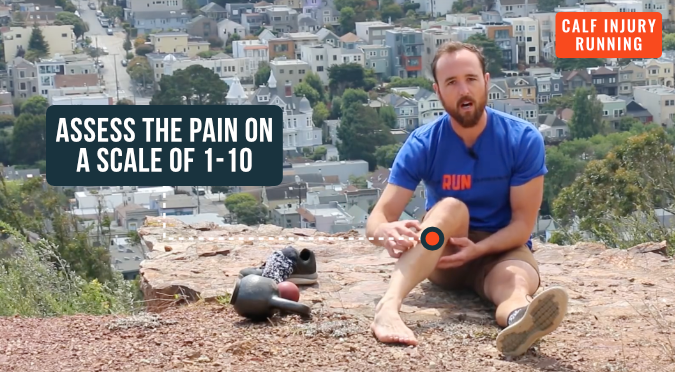 When it comes to assessing a calf injury in runners, you’ve GOT to be specific. If we can’t identify the source of the pain and which muscles are tight, we can’t properly “fix” and then PREVENT future injuries. Is it up near the knee? Is it down above the ankle, perhaps near the achilles’ tendon? Is it on the outer lateral aspect? Is it on the inside, closer to the shin bone? Or is it maybe not even a calf injury at all? Is it something related to another area of the leg? A shin splint? Once we’ve identified which quadrant the pain is inhabiting, we can throw around some potential causes. For example, if the pain is around the sides of the ankle, it could be an issue of foot collapse in the footstrike. If the pain is more central at the back, near the achilles, or just below the largest part of the calf, you could be putting most of your weight on your toes when you run – the heels maybe not even hitting the ground at all. The result? Stiffness in the front of the ankle and REALLY tight calves. Gauge the level of pain. A basic 1-10 scale will do. The more acute, unbearable pain will fall closer to 10, and the more moderate “naggy” types of pain will fall somewhere between 1 and 4. The intensity of the pain will be an indication of how to properly address the injury. It could be as simple as making an adjustment in your foot strike or as complicated as incorporating a new mobility routine, focused rest & repair. When it comes to mobility for calf injury in runners, you’ll want to get into the deeper tissues! There’s a lot going on “under the hood”, so it’ll be most effective to address the points of pain specifically. Sit it on the ground, in front of you with the handle pointed up. Now you sit on the ground, with your legs extended in front of you, one of them resting on top of the handle. Start with your lower calf on the handle, rolling laterally side to side. Add in some ankle circles in both directions. 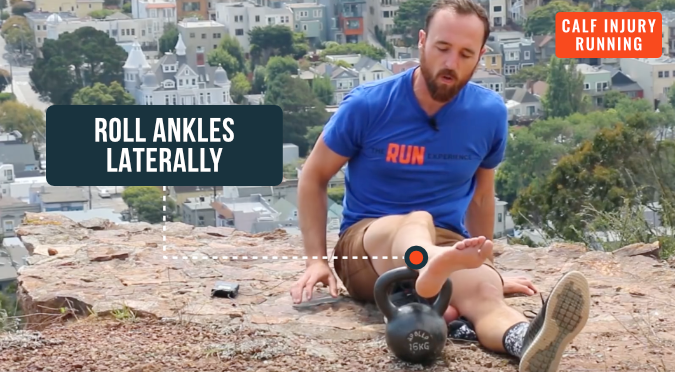 After a minute or so in this area, adjust the leg so that the middle of the calf is now resting on the kettlebell handle. Repeat the rolling and circles. After a minute or so here, repeat everything on the upper part of the calf. And of course, repeat ALL of this on the other leg! Grab a yoga tune-up ball, lacrosse ball, or something similar. Find a kneeling position on the ground. Place the ball just under the hamstring, right between the bulk of the calf and the back of the knee. Sit back into your kneeling position, on the ball. Spend about 2 minutes rolling side to side, working into the areas that are tight. Repeat everything with the ball on the other leg. No matter where you FEEL the pain in your calf, there’s a good chance that other tight areas are responsible for contributing. Make sure to mobilize through ALL parts of your calves regularly! Okay, so we’ve assessed and “fixed” your calf injury. Now, let’s look at how to make sure this won’t happen again…at least if you have a say in it! When it comes to calf injury in runners…we like to use two categories. Let’s take a close look at both. Your pain is probably in the low medial area of the calf, close or on the achilles’ tendon. When running, you probably spend most of your time on your toes, the heels rarely touching the ground. *You can have a friend film you running, if you aren’t sure. You may not be able to get very low in an air squat position. So how can you loosen up those ankles for a more relaxed footstrike? Start by hopping in place. With each hop, the heels should lightly “kiss” the ground before peeling off for the next repetition. Once you’ve found a nice rhythm here, start jogging in place. Again, making sure the heels are kissing the ground with each step. If you’re having trouble here, try shaking out and relaxing the shoulders and taking some big deep breaths. Each time your foot pulls of the ground, the ankle should be totally relaxed. **You can also loosen the ankles up by spending some time at the bottom of your squat. Feel free to rock back and forth, side to side while you’re down there. Your pain is probably on a lateral aspect of the ankle, maybe near the shin. When you run, the arch of your foot repeatedly collapses to the ground with the ankle rolling in. You experience occasional (or regular) pain on the inside of the knee. Chances are good that you’re lacking strength and stability in your hips and ankles. Try finding a tall, engaged position, standing on one leg with the other bent up off the ground. Accumulate 3 minutes on both sides. To make this more challenging, take the stand into a single leg deadlift. Accumulate 10 per side for 3 rounds. Another option would be taking the single leg deadlift into a lunge. Again, accumulate 10 per side for 3 rounds. The foot can’t collapse if it doesn’t have time to do so! Try increasing your cadence (how many times your foot hits the ground per minute)! Practice jogging in place or on a flat stretch, using a metronome to work up to a cadence of 85-95 steps per foot, per minute. The quicker you can move your feet, the less time you’ll have to let poor positions creep in and cause calf injury! Use this progression, these exercises and assessment tips to best address all calf injury in runners! Good luck, athletes! 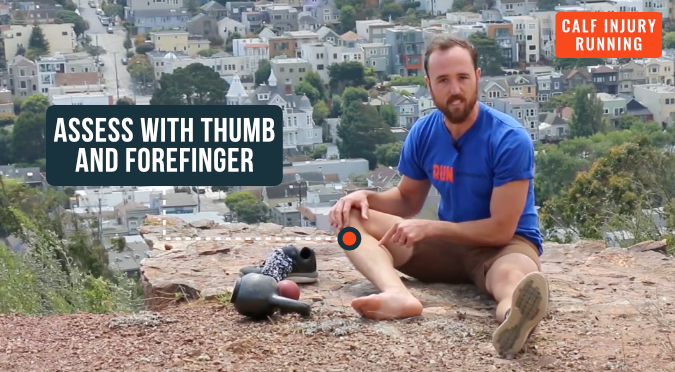 For sticking with us, enjoy this FREE injury prevention video series. We address all areas of injury in runners, showing you how to treat and prevent from the comfort of your home! Get it HERE!